Well it is almost December now and that means the holiday season is in full swing. I hope that everyone in the USA had a good Thanksgiving holiday last week. I hope also that everyone will have a Merry Christmas and a Happy New Year. The next project I am going to be working on is actually already taking place its for my wife she is going to be selling some of her crafts and items shes made at a Holiday Boutique near our house this weekend. My job is to be building what she is going to be displaying all her stuff on. I will get pictures of what it looks like before, of what is still left to be completed, and the after. After that the next project that I am going to tackle is documenting the development of my iPad game that I have been working on and the Eve-Online Web application that is almost to the point of delivery. Halloween Project Pt. 4 & November! Wow it is already November 1st the year is almost gone and this site is had more updates to it this 4th Quarter of the year than the past few years combined. I have decided in the next few months I am going to go ahead and create Little kits that you can buy or just buy the plans for and pick up at Radioshack (the parts) for what I do here. I believe that this would be a good thing as sometimes you can not always get places and it is easier to buy online. It will not only come with the parts but it will also come with the wire, I am still trying to decide if I am going to include Solder but I do not think so as it is made with lead and some states its not allowed. Some kits will be just the basic electronics while others will be full on kits with everything needed to create it from the ground up. This is still a thought and a Idea I am going to play with and see how it goes. The halloween project worked but I was unable to complete the head setup as it really didn’t come out well. The next projects that I am going to be working on is one for my 2 year old son, it will be a chalkboard & Drawing Easel made from some 2×4’s and plywood. The second project of mine is going to be a small Tardis Lantern for my wife who is a MAJOR Doctor Who Fan. So please keep checking back as I will be posting more projects up here and plan on getting the project Page of mine completed that will list everything that has been done and created on it. Well me I have had a busy weekend and have not had time to upload the final project picture due to the fact it has not been placed into the mask yet. 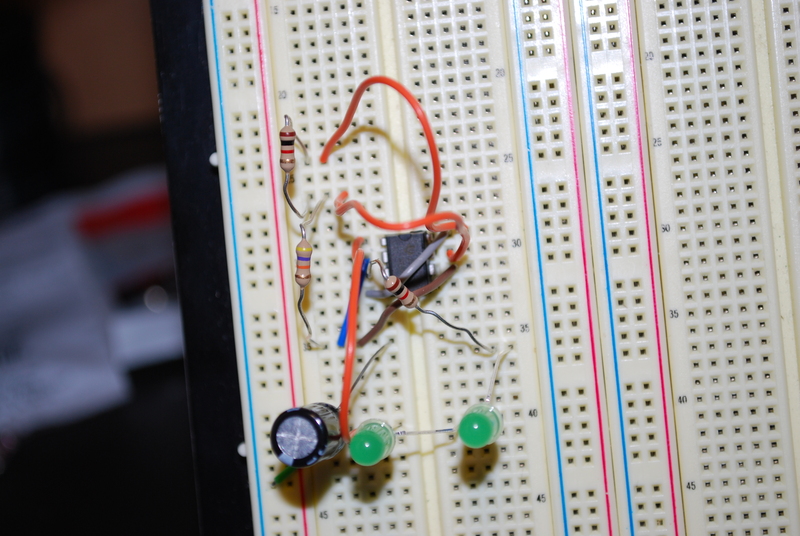 The reason for this is because I have to remake the little circuit because I fried the 555 Timer on it. In the result I have made it smaller and better off than it was before but that went to my nephew and his costume. For people wondering my wife made the box head I am going to be waring and her site is http://www.uniquedesignsbymonica.com/ on that site you will find many items that she makes by hand and they are for sale. She will also show you how to make the items that she shows on the site. Our next project we are going to be working on will be making a small scale Tardis replica from the show Doctor Who and maybe after that a sonic Screwdriver. So please make sure to come back for the Part 4 of the Halloween Project which will be the final part of the project then look for the Tardis Project we will be working on together. Till my next update have a happy Halloween and Safe Tricker Treating! Well today’s project update Part 3 is going to be about the circuit and the building of it. First we must start with all the parts that we bought and we will be placing them into the breadboard, pictures of everything will be below as always, this way we can make sure that the circuit does what we want before we wire up everything. This is the view of the same Circuit from the top to show more of the layout and how it is connected. Well this is not really part 3 of the halloween project I am working on but more of part 2.1 because after testing the circuit last night I found that the Capacitor was actually smaller than needed to get the desired effect. I happened to have a 100μF Capacitor to use and that worked little bit better. I still think tho that I will need to get a 50μF Capacitor to actually reach the intended look. Below are the updated Circuits on the concept. This has more of a Random Blink to it due to the 555 Timer and the Capacitor size. Version 3 this has C1 changed from a 1μF cap Or a 100μF cap to a 50μF cap. This one is yet to be tested as I just thought of it but I will be testing it tonight and will report tomorrow with Video on how all 3 of them work. Well yesterday I posted about the Halloween Project I am working on here is Part 2 the electrical circuit that I have created to be able to pulse the LED. The Circuit is not the final design because I have not had time to test it and that is what tonight will be for the testing of the circuit when I go buy the parts from Radioshack. This is the Diagram of the Circuit that I have created to run the eyes of the Creeper. Might have to change the Resistors or capacitor tho. More to come in Part 3 tomorrow! Stay tuned for more information and pictures. Well I have been asked by my loving wife to think of a halloween costume and as with every year I find it hard to think of something that I could be and not look like a dork. So I find out that my Nephew is going to go as Steve from Minecraft. He also has a small box that was turned into a Creeper. And he has it as a small box thats is just a creeper head. So I figured I can do something like this! And decided that I am going to be going as a giant Creeper from Minecraft! But talking to his dad I said that I was willing to make his small box Creeper’s Eye’s glow for them and so I am going to make my giant Creeper Costume eye’s glow too but this will not just be Green but also red. I have come up with the Schematic but still have some testing and to buy some parts for it. So now I will need to go to my local Radio Shack this week and buy a few things to get the list is below. So the Timer is going to be the main part of the application because it will be what will regulate the power over the whole design of the application. 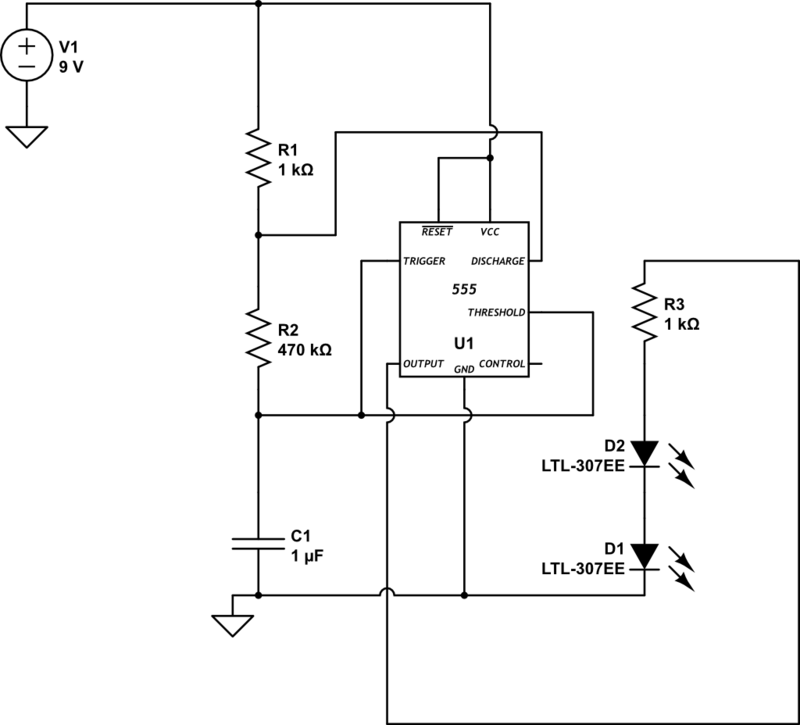 This is a small chip that is setup to send pulses of electricity out some of the pins while lowering the voltage down. The Resisters also help lower the voltage and the wattage down so one you do not burn out the LED’s you place. The reason for the capacitor is so we can spike the LED’s and make it look like a slow glow that we are looking for. The reason why we need the PCB Board because we need to use the traces that will wire up the whole Circuit. The 20 Gage wire will be used to hook up the eyes from the board to each of the eye sockets of the box and then be able to hold the device in the box out of the way of my head. Soon as I buy the parts I will submit part 2 of this project and build. Well tonight I had some time as I was watching the Giants and St. Louis game on tv and thought I would work on my Arduino project. The project that me and my wife have come up with is actually right around the corner its to do with Halloween its going to make the eyes on the pumpkins, skeletons, spiders, and bats light up and glow. The code I have come up with right now is not the code but its also something I am working on for my son he is 2 and likes playing with his cars so I am making him a stop light. This also works for my train set to be the lights on the crossing signs or other places. This also will work for use with Thanksgiving, Christmas, and New Years because it is just messing with lights. Now you can run the LED’s in Parallel but you will need to make sure you have the right voltage and resistor on the device. Now lets get to the code! This will blink 3 different lights on and off in a row and keep rotating. it will be the number of the digital pin. delay we can change it the higher we go the more time it will take 500ms is about 1 1/2 seconds. If it goes to low then it will be as if it was always on. Sure that is simple code but for my first real test and application for the Arduino its not bad. I plan on getting more code up I am going to make the eyes Fade in and out, but I am trying to decide should I make them work off a motion sensor so they fade in and out slowly but the closer you get the faster they go till they are on the whole time? Let me know what you think about this. Well here is the 2nd posting that has the rest of what I showed in Part 1. 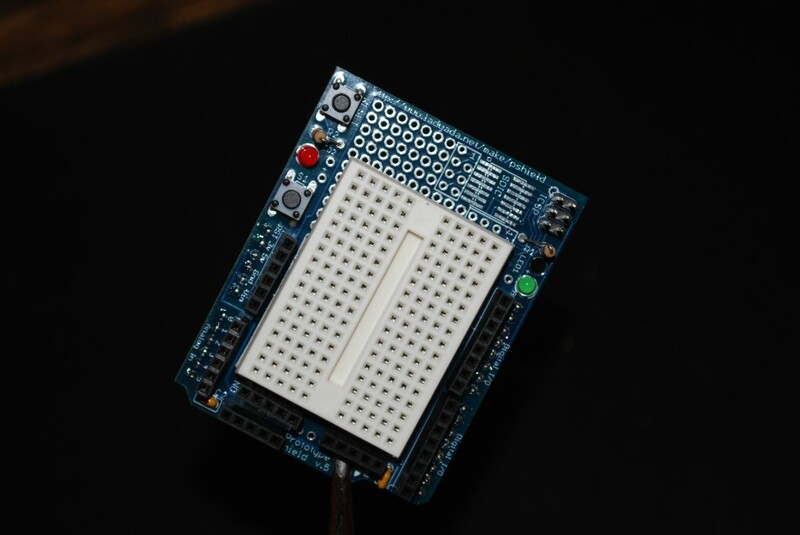 I have finally fixed the Prototype Shield and will be showing that along with how it fits on top of the Arduino. Also I will be showing the other tools that I got in order to fix this and make this Shield. 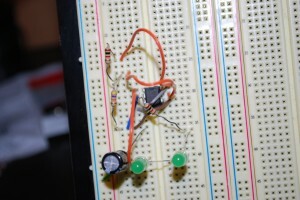 And then in a later one I will be posting the video and such for the blinking LED. Here is the picture of the completed Protoshield is done with all the soldering and working. This is what it looks like completed with all the Soldering done.